A typo can be very costly. Avoiding them makes a reputation. For Thousand Oaks-based Agnew Multilingual, a missed accent mark can cost thousands of dollars and destroy a relationship. The company translates the communications of American businesses into foreign tongues for consumption near and abroad. Many American companies conduct business internationally, in unfamiliar languages. They have no easy way of telling whether a translation is correct. A misplaced verb or incorrect conjugation can end up on business cards, billboards and brochures blanketed across a foreign nation before it is caught. Almost as bad is when translations use inconsistent brand vocabulary or use lingo that isn’t du jour. For founder Irene Agnew, her company’s reputation is built on creating a consistent and correct product every time. 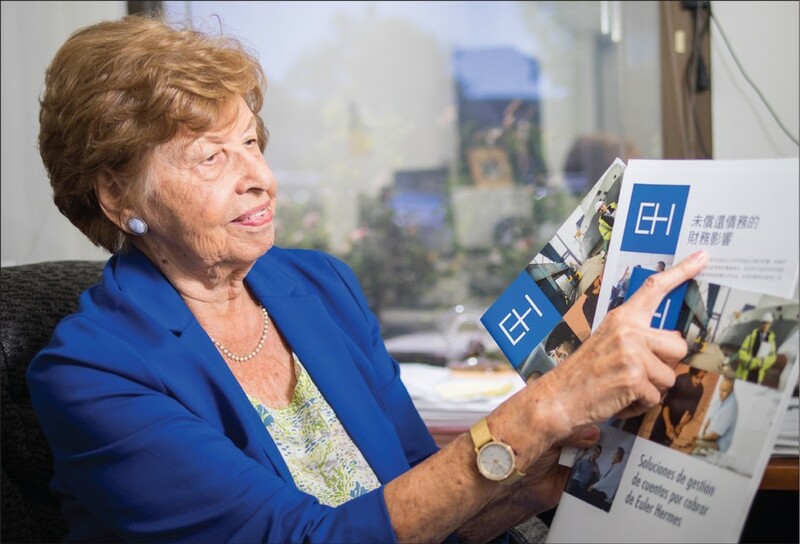 The 88-year-old Agnew herself was the mastermind behind the company’s groundbreaking translation, team and contract management software. It’s the way a mere seven employees can manage a team of 1,300 independent contractors spread across the globe. The cloud-based software keeps track of every translation in progress, clients, translators, potential translators and billing. With a single click, Agnew can easily see a progress dashboard of every project the company is working on. 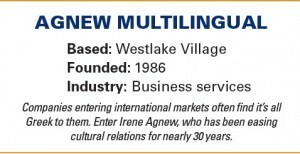 Agnew Multilingual uses a 21-step workflow to translate a business card, video or website. Everything from initial consultation to final checks and delivery is documented and recorded in the system so it can be replicated when needed. The online system lets the company efficiently complete both $150 and $300,000 projects. Some projects can be both very large and very fast. A company submitting a government contract proposal with a hard deadline can sometimes have seven translators and two editors working overnight to make sure it gets done. Creating a proper translation all starts with hiring high-quality translators, Agnew said. Her company only hires native speakers and generally requires either a translator or editor be based where a product is intended to be marketed. Languages evolve at a rapid pace, and being comprehensible and sounding natural is more important than simply following by-the-book grammar rules, Angew said. Translation is all about respect, and gaining the trust of a country’s customers all starts with respecting their language. Professional translators are frequently paired with editors long-term to create the best results. The company has so many applicants and contractors in its database that it is able to find experts in both topic and language. Translating a biology book or airplane manual requires more than just simple language skills. Marta Alonzo, of marketing-company Axis, said the first time she contacted Multilingual, she asked the company to translate something into Spanish. They asked, “What type of Spanish?” For Multilingual, American Spanish is very different from Mexican Spanish, which are both completely different from the Spanish of Spain — and hundreds of other Spanish dialects. Matching a translation with an intended audience is the firm’s entire practice. Most recently, Alonzo worked with Multilingual to translate materials for Covered California, California’s public health insurance exchange, into more than 11 languages including Tagalog (originally spoken in the Philippines), Lao (Laos) and Hmong (Vietnam and China). Multilingual’s online workflow system is language-agnostic, and Agnew said the company recently completed some work in Navajo. So many qualified applicants are interested in joining the team that the company has an entire second-tier database for people who are fully qualified and vetted, who can pick up a job if top contractors are unable to. According to Agnew, her translation firm can even be used as an ad hoc foreign affairs indicator. In recent months, for instance, the number of translations requested for Iraqi languages dropped to almost nothing as the country erupted into renewed chaos. She likes to first spot a language trend and then later find out why in the news.